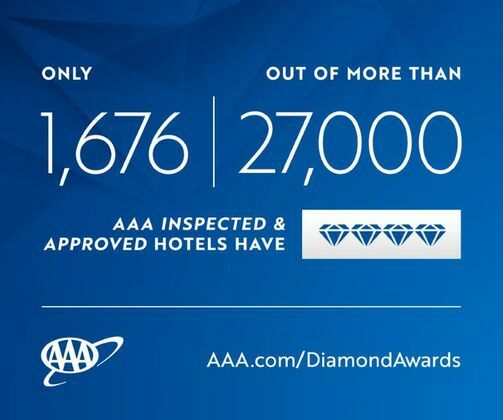 Kimpton Hotel Monaco Pittsburgh has received the esteemed AAA Four Diamond Rating. This is the first time the hotel has attained this celebrated designation. With a location perfect for business travelers or theatergoers, Kimpton Hotel Monaco gives a nod to local culture. Its unique decor includes black and gold armoires in each room. Enjoy the more than spacious guest rooms, the lobby area called "The Living Room" and "The Biergarten" on the roof in the summer time. Kimpton Hotel Monaco joins four other hotels that have proven once again that they are Pittsburgh’s hospitality “gems,” according to AAA East Central. These establishments have been awarded AAA Four Diamond Awards for excellent service, and opulent décor. Fairmont Pittsburgh, 510 Market Street, a Four Diamond hotel since 2010. While hip and modern in design, you'll find nods to the city's history with Andy Warhol prints and artifacts unearthed during the hotel's construction. Rooms offer lush bedding and big windows. The health club is truly a marvel with its wide array of fitness equipment, personal trainers, on-demand exercise classes and variety of infused waters to keep you hydrated during your workout. Omni William Penn Hotel, 530 William Penn Place, a Four Diamond hotel since 2012. This traditionally styled hotel offers rooms with oak furnishings and floral-patterned accents. The underground bar, Speakeasy, hearkens to the Prohibition era and is known for its drink program. The lobby is expansive and offers ample seating areas plus shops, a coffee bar and restaurant. Guests can range from sports stars to presidents and diplomats from around the globe. Renaissance Pittsburgh Hotel, 107 Sixth Street, a Four Diamond hotel since 2002. This historic hotel's lobby offers a gorgeous 1906 rotunda, white marble walls and a mosaic ceiling. Rooms have incredibly soft triple-sheeted bedding, and some have views of PNC Park or the river. This downtown location previously served as a theater and a nightclub but has been kept in pristine condition. Grab a drink in Braddock's Bar, known for its extensive whiskey selection, and take the time to soak in your beautiful surroundings. The Inn on Negley, 703 South Negley Avenue, a Four Diamond hotel since 2016. It's just a short walk to trendy Shadyside shops and restaurants from this beautiful Victorian home that offers spacious rooms decorated in restored antiques. Enjoy breakfast outdoors when it's warm. The lobby offers a welcoming first impression with its high ceilings, dark tones and fresh floral arrangements. Some rooms feature fireplaces and sitting areas overlooking the garden, which add a sense of tranquility to your stay. High tea in the ornate dining room is not to be missed.